With the Christmas party season in full swing it has got me thinking of how I will doing my makeup this festive season. With my Christmas party being in mid December i’ve got a bit of time to plan and try out a few different makeup looks, and I thought if you too were in the same predicament as me then this post may help you with some ideas! This year my Christmas party is a masquerade themed party, which i’m really excited for as last year we didn’t really have a theme so i’m really looking forward to getting all glitzy and rocking my mask., although let’s be honest I probably won’t keep it on very long! I thought i’d share some of my favourite eyeshadows for the festive season, and you’ll definitely notice a theme in my personal choice for eyeshadows but I hope this gives you some ideas for the festive period. Now when it comes to eyeshadows you can’t not mention an Urban Decay palette, because let’s be honest they are just bloody amazing and my favourite has to be their Naked 3 Palette (£38.50) as the shades although they are still neutral, the addition of pink undertones to the shadows just adds something different to each shade. This palette was actually my first Urban Decay palette and it has gotten a lot of love over the years, and although I do play it quite safe when it comes to my eyeshadow looks, this palette can create some absolutely stunning looks. My favourite shades are Burnout, Trick & Lair with all three of these shades creating a subtle yet smokey eye look with a gold touch that would be perfect for the festive season. On the more budget side of eyeshadows and a great brand for duping the Urban Decay palettes is Makeup Revolution who I haven’t spoken much of recently but I still absolutely love this brand for it’s amazing yet affordable products. The Iconic 2 Palette* (£4) is an amazing dupe for the Naked 2 palette which is the only palette from the Naked family that I don’t own but with this palette I feel that I don’t really need to. I absolutely love this palette for the mix of bronze and gold shades that are just me all over, and this palette has gotten a lot of love from me over the past year or so. If you’re wanting a new palette that isn’t going to break the bank, then this is the palette you want to get your hands on! Another eyeshadow from Makeup Revolution that I just love is their Pure Pigments, which unfortunately they seemed to have discontinued and i’ve only just discovered this when typing up this post, but these are basically a loose pigmented eyeshadow that I love to add a nice dusting of glitter goodness to my lids. A lot of makeup brands do these as a dupe for the MAC loose pigment shadows and they are great for packing on colour to the lid or as I prefer to use them for finishing off your eyeshadow look. A similar product and shade to the Makeup Revolution one is a good old throwback favourite of mine from Barry M and if like me, you were obsessed with their dazzle dusts! The shade Dust Tan (£4.59) is really similar to the one i’ve featured, and if I remember rightly they are super super glittery, which is perfect for the festive season if you want to add a pinch of sparkle. Lasting we have one of my favourite eyeshadow quads from Me Me Me Cosmetics and this is their Quad Baked Goddess Eyes Eyeshadow, which I got in a set a few years back and you can only get this in their Professional Set (£120) which is a shame but I personally love Me Me Me and this would make a lovely Christmas present to yourself. I love this eyeshadow not only for the shades, but because the shades in the quad allow you to make a complete eye look really easily. I also love the formula of these eyeshadows as the baked formula to them makes them a little more creamy and they glide on beautifully. If you know of any other baked eyeshadows then leave them in the comments, because they are truly lovely to work with. 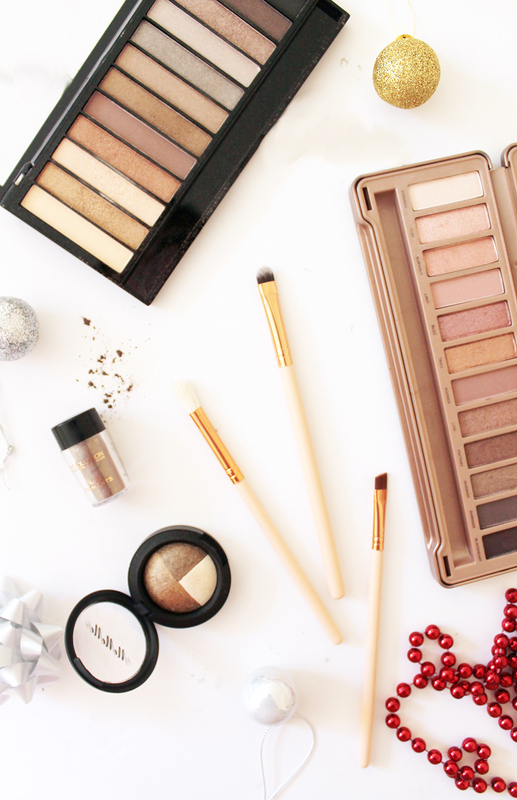 What are your favourite eyeshadows for the festive season? Next Post Christmas Party Shopping Challenge with boon.